Residential solar power is a great investment for homeowners—whether you are looking to save money, reduce your impact on our environment, or increase the value of your home. The key is to find the right system for your goals, energy needs, and budget. We spend the time with you to custom design your solar electric system that meets both your budgetary goals and production expectations. Federal Tax Credit: Provides residential installations with a 30% tax credit. The personal tax credit was extended in December of 2015 and will be available through 2019 at 30%, then tier down to 26% in 2020 and 22% in 2021. Focus On Energy: Is offering up to $2,000 in a cash back rebate payable 8-10 weeks after system commissioning. North Wind will submit all application documents to Focus on Energy on your behalf. 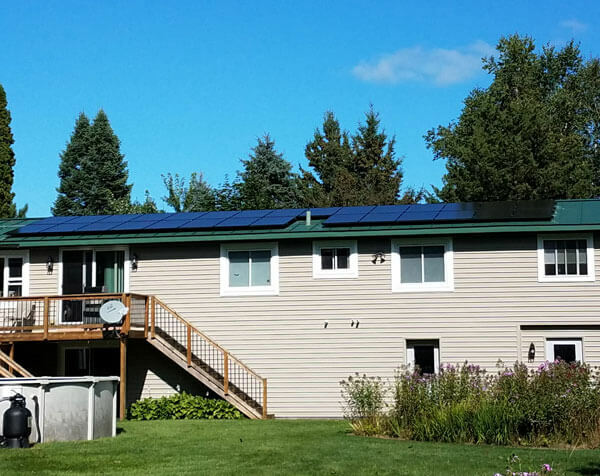 State Sales Tax Exemption: Wisconsin holds a 100% exemption from sales and use tax for eligible purchases of your solar electric or solar heating system. Call us. It all begins with us getting to know you and your goals for solar. There are no site visits until both of us are ready. 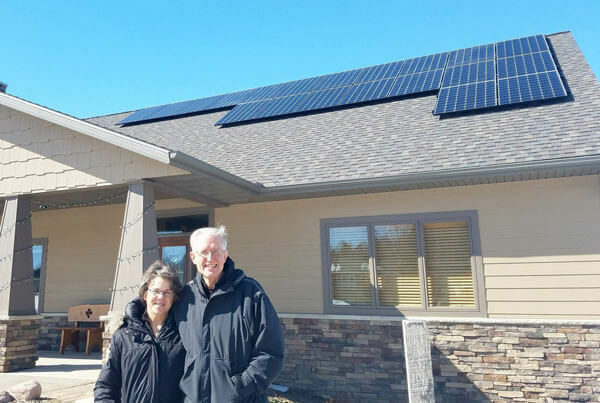 At North Wind, we believe you should have a basic understanding of solar, know what size of system might work well for you, how much it may cost and what kind of incentives are available to you. There are usually a lot of questions – we find a phone conversation works best at this point in our relationship. An informed customer is our best customer. To get started, we need to understand how your home uses electricity, when you use electricity, and how much electricity you use. We'll ask for your most recent 12 months of energy usage history from your utility. What we're trying to know are the number of kilowatt-hours (kWh's) you purchase from your utility each month. Using that data, we can generate some initial estimates for you to consider. If those initial estimates fall somewhere near your anticipated budget, we can then move to the next step - the site visit. After you have an understanding of solar energy, its costs, energy generation and how it will work on your home, an experienced Solar Design Consultant will schedule a visit with you. We will look over your roof, verify your solar resource and evaluate your electrical system. A thorough site evaluation is critical to the successful design and installation of your solar electric system. The result is a customized, turn-key solar proposal for you and your home! 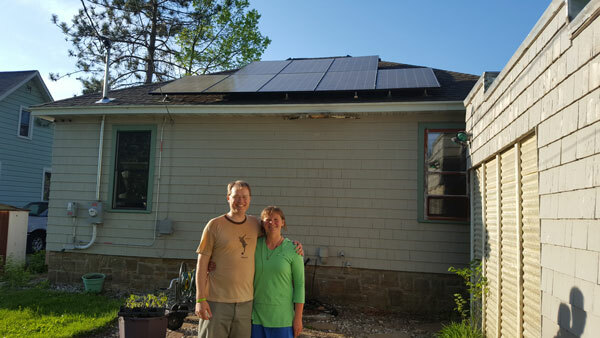 Step 3 – You are ready to go solar! Once you've made a decision on the perfect system designed for you – one that meets your energy goals and your budget - we will enter into a purchase agreement with you. At this meeting we will sign utility interconnection paperwork and apply for any incentives you may qualify for. At that time, we will also collect the first payment for your solar installation. Now the wheels start turning. We order your equipment, submit the interconnection paperwork to your utility and secure all the needed permits. You'll never have to deal with the stress of getting your system approved by the right people or worry that it might give you complications later on. Every system we install adheres to strict National Electric Code (NEC) requirements. 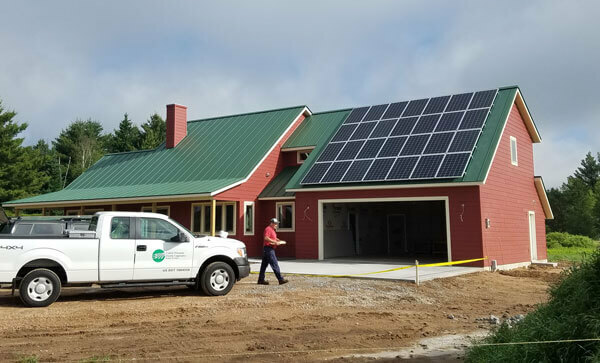 Our team orchestrates the entire process, keeping an eye on everything—minimizing any hang-ups or project delays, meaning that you get your solar, and your savings, quickly. Our talented installation crew is the best in the business and we put the right people on the right job. We monitor every aspect of your project to ensure it’s finished quickly, aesthetically and electrically correct. Today is the day you are powered by the sun! We schedule and represent you at the utility inspection and your municipality's inspection. We commission your system to ensure that it performs as we designed it. We will explain how your system works, and when you need to call us if it does not. There is really not that much for you to do as a solar system owner. That is the beauty of solar energy. You will never look at a sunny day the same way again! Once your project is completed, our team keeps an eye on performance via online performance monitoring software. Should you opt to include on-line monitoring with your solar system you can see what your system is doing for your home, any day, any time from your computer or smartphone. If there is ever an issue, we can more quickly troubleshoot the issue and if necessary, dispatch a service technician to fix the problem.